Billy Crudup had his best year as an actor in 2000, when he played dissolute in Jesus’ Son and a musician in Almost Famous—both with seemingly effortless charm and empathy. 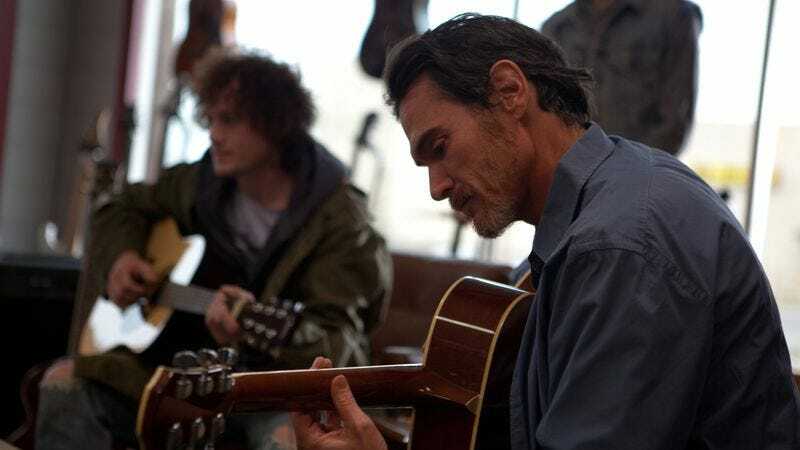 In Rudderless, he plays a dissolute musician (though more the former than the latter), and at first his performance has more in common with some of his later indie work—where his effort becomes more visible. Crudup’s Sam is a man whose college-aged son, Josh (Miles Heizer), dies in a school shooting, sending the father into a tailspin. The ensuing scenes of him stumbling through life in an alcoholic haze, refusing to give a damn about anything, rely on Crudup’s ability to wield caustic sarcasm—and for all of his gifts as an actor, that has never been one of his strong suits. He’s better at revealing the pain beneath a smiling exterior, which becomes a major engine of Rudderless as the film progresses. When he discovers a box of song demos Josh recorded before his death, Sam teaches himself to play one on his guitar, and on a whim performs it at an open-mic night. (In the audience, waiting for his turn to play, Crudup has a wonderful little moment where he takes his hands off his drink just long enough to clap exactly twice for another singer.) Sam’s performance attracts the attention of Quentin (Anton Yelchin), a local kid who hounds him to play more songs and, eventually, to let him provide additional accompaniment. Soon they’re in a popular bar band fueled entirely by Josh’s songwriting, unbeknownst to anyone but Sam. The movie’s wide-eyed appreciation of emotive folk-rock acquired through tragic and morally murky circumstances suggests World’s Greatest Dad as directed by John Carney. Rudderless is directed and co-written by William H. Macy, and it’s very much the kind of earnest indie drama good actors like to nurture. The songs, generically rousing as they are, help distinguish the movie from its mourning-drama brethren and infuse it with some energy. The most thrilling sequence is an old standby, a montage of the band gaining in popularity, and Macy links the footage together with a series of trick pans and match cuts, capturing the group’s momentum. As a director, Macy generally shows mastery in the craft of passing time on screen: Early on, a cut from one microwave pizza to another spans several weeks, while a bigger time-jump that finds Crudup living on a boat says so much about his trajectory that the “two years later” title card is almost unnecessary. That’s typical of a movie that consistently pushes too hard, even when it’s doing something right. Yelchin’s yammering-enthusiast routine, for example, is overwritten, especially in his early scenes, but nonetheless offers a touching portrait of a guy who wants to be in a band and thinks he doesn’t have the goods on his own. Even one notable attempt at restraint feels, paradoxically, like too much: Macy withholds some information about the school shooting that is both predictable and thought-provoking enough to warrant more direct address before the final 30 minutes. 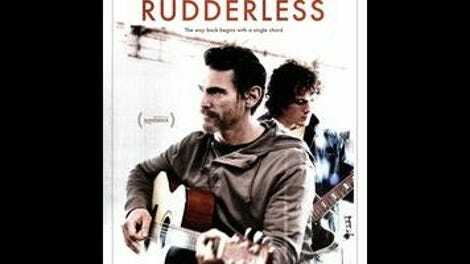 Rudderless accumulates puzzling details and goodwill in near-equal measure. It’s unfortunate and strange, for example, that Sam’s band must be stocked with three similarly mop-headed guys (including musician and non-actor Ben Kweller), while the movie’s female characters are conspicuously limited to exes and groupies. Or that any time at all is devoted to a miniature snobs-versus-slobs subplot involving Sam’s boat. The goodwill is generated by the performances and the core of the story—and by the pleasing, unexpected sight of Crudup strapping on a guitar again.